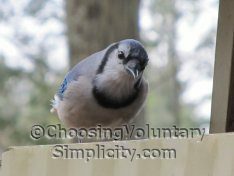 Home » Enjoying Nature » What Are the Odds? Sometime during last night, an apple fell off the tree and landed “just right” onto one of these sharp, pointed, broken-off stubs. 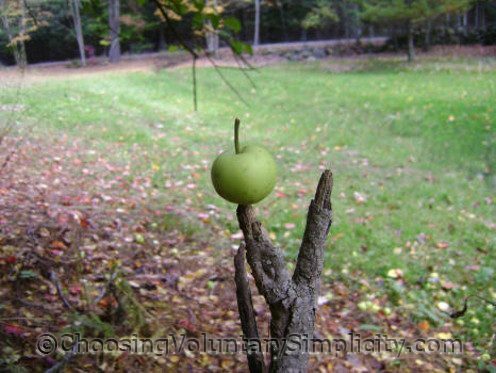 The apple is impaled on the point… almost exactly through its center… in an almost perfectly upright position. Deserving of a photograph, don’t you think? Wow! This is so cool! You’re right, it *is* deserving of a photograph! Now this unfortunate apple is preserved for immortality! You said it fell just right but I think it fell just wrong. Love your blog btw. I’m a regular reader. A great example of ‘a picture is worth a thousand words’. That’s why I love living in nature so much. There is so much to appreciate that most people don’t even notice. Your blog is wonderful. LOL love it – are you going to leave it there for the birds to enjoy? Thanks for sharing that neat picture!